The Grace Sling Dining set features six sling chairs and a dining table. The dining table pictured here is the Stonegate Complete Rectangular Table by Homecrest, which features a natural granite style countertop. The six dining chairs feature all-weather sling and an extruded aluminum frame. All weather sling material is safe for use outdoors: rain, shine, or otherwise. Choose the style that meets the need of your outdoor space. Homecrest provides a generous selection of sling types and colors to choose from. There is a huge selection of extruded aluminum frames that are suitable for outdoor use and exposure to elements like salt, wind and water without rust or visible damage. The frames are coated with a protective powder coating. 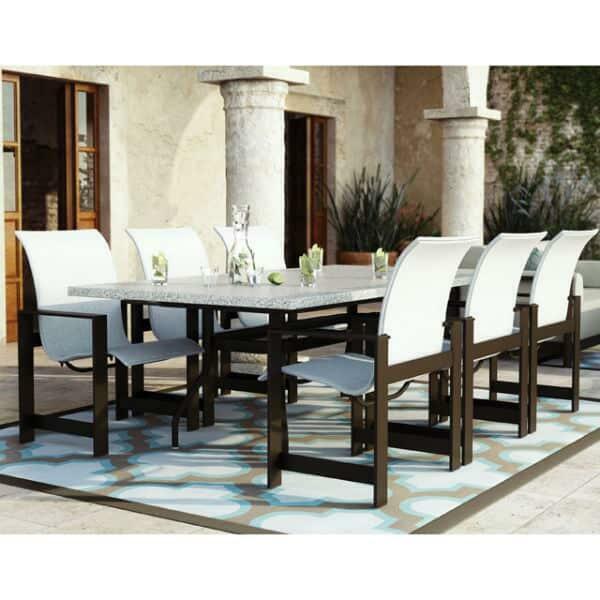 Homecrest has a huge selection of outdoor furniture, ranging from lounge chairs to deep seating collections to other dining sets. Find other Grace collections, like the Grace Deep Seating Collection, to perfectly complement the Grace Sling Dining set of your dreams.